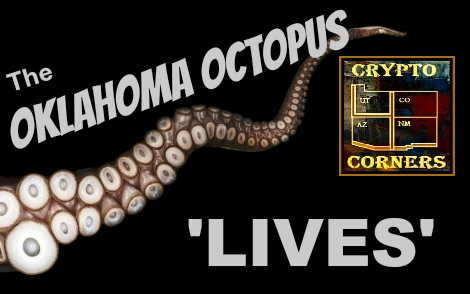 Jc Johnson of Crypto Four Corners called me recently in reference to the mysterious Oklahoma Octopus. Supposedly this cryptid is a freshwater cephalopod-like creature generally said to inhabit at least two lakes in Oklahoma (Lake Thunderbird and Lake Tenkiller...there is some mention of Lake Oolagah as well) where it attacks and kills unsuspecting swimmers. According to legend, this freshwater monster measures the size of a horse and resembles a marine octopus, with long tentacles and leathery, reddish-brown skin. Skeptics question how an octopus (an ocean creature) could survive in freshwater lakes, even though jelly fish and sharks have been known to live in freshwater. But it is easy to believe that such a creature would be a fearsome predator. The Giant Pacific Octopus, for example, has tentacles that each boast the strength of a 200-pound man and a powerful beak that it uses to kill prey. Recently, it came to Jc's attention that on April 6, 2011 in the Canadian River, near Oklahoma City, Oklahoma this small cephalopod was caught. 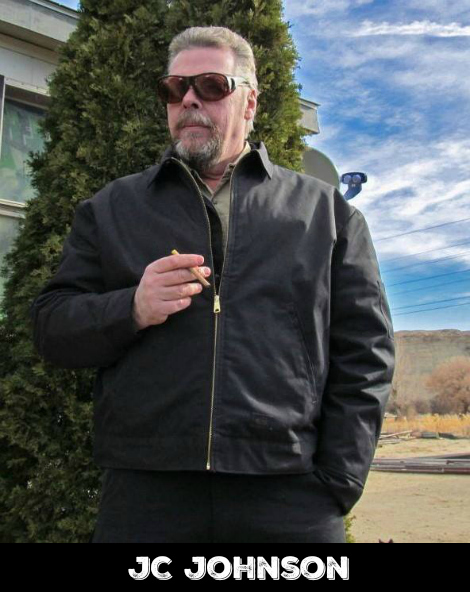 The photo comes by way of Jc's associate Steven Freeman, who was the first to investigate the circumstances of the photo. 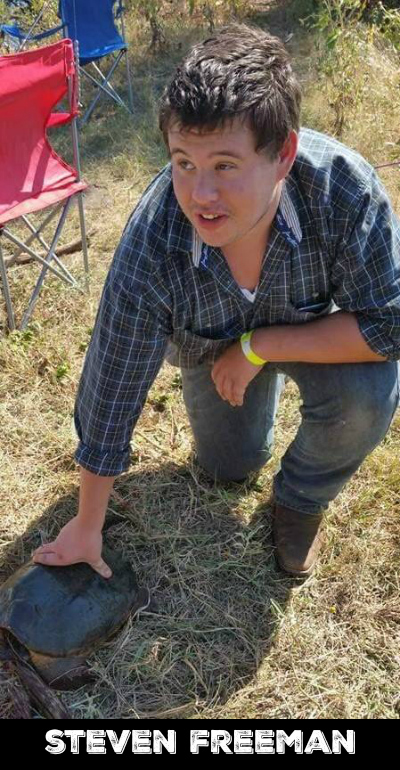 He is also an Oklahoma resident, and is currently following up on sightings. He is presently active in the process of procuring a cephalopod for examination. The man in the photo reports seeing 4 or 5 more along the shore but reports this one was caught about 30' from shore. It was not reported to wildlife officials. One lady reported catching one at Lake Thunderbird on October 1st of this year at a depth of 30' using minnows for bait, but her telephone was dead...so no pictures were available. 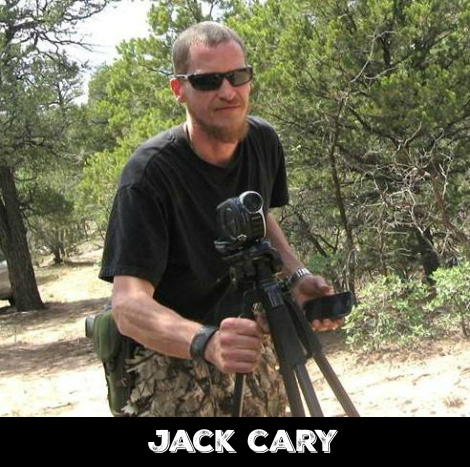 C4C investigator Jack Cary adds that while growing up in these areas, there were many reports of water skiers and swimmers being pulled underwater never to be seen again. Also, there has been talk of people who survived attacks while swimming, swearing that "tentacles' wrapped around them pulling them into deeper water. There is an established story that three teenagers, Tyler Shuman, Ruthie Simple and Bruce DelRoy were reported to have drown, pulled down by the creature. The reports also apparently state the two other teenagers with them had blister like wounds and scabs, like the marks caused by octopus suckers. The tales goes back to the Native Americans of eastern Oklahoma (especially the Caddo Empire), who told legends of a large creature that looked somewhat like a leech and ate men alive...even though the lakes were man-made in the mid-20th century. The stories go on to say that the ponds were linked underground so the tentacle creature would lurk just beneath the surface waiting for prey to come for a drink. It would then drag them to their deaths. When the lakes were made, the creatures moved in, but still lurked in the old springs that lead to the lake bottom. This information will need to be investigated. The Crypto Four Corners team is planning a spring expedition to capture one of these Oklahoma cephalopod...at the same time Steven Freeman is in the area attempting to capture a specimen. In the meantime, Jc continues to conduct research in the upper Midwest along the Canadian border. Phantoms & Monsters will acquire exclusive access to any information and evidence established.